There is nothing better in the world than a big old plate of comfort food, and what sounds more comforting than a heaping mound of meat and potatoes? UM, nothing. 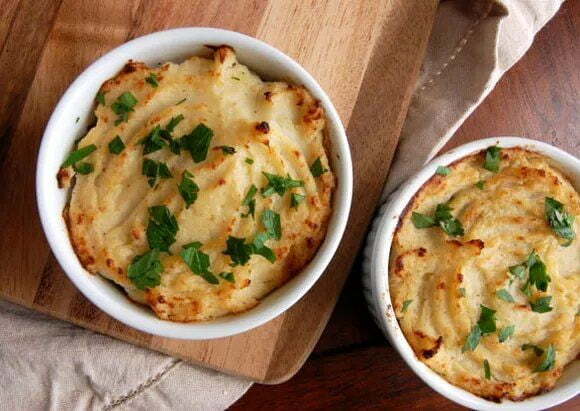 Shepherds pie is like the staple of what I consider to be comfort food. It is rich and savory and makes me feel good inside. Now if only there was a way to maintain all that delicious flavor and warm comfort while disseminating all the excess fat and calories. Oh wait! There is. After much research and experiments I created the perfect healthy version of shepherds pie … because let’s face it, what is life without it. Place a couple inches of water in a large pot. Once the water is boiling, place steamer insert and then cauliflower florets into the pot and cover. Steam for 12-14 minutes, until tender. Drain and return cauliflower to the pot. You can follow the same process for the sweet potato. Add the ghee/coconut oil, mustard, salt, and pepper to the cauliflower/sweet potato. Using an immersion blender or food processor, combine the ingredients until smooth. Set aside. Meanwhile, heat the coconut oil in a large skillet over medium heat. Add the onion, celery, and carrots and sauté for 5 minutes. Add in the ground turkey and cook until browned. Stir in the tomatoes, chicken broth, and remaining spices into the meat mixture. Season to taste with salt and pepper. Simmer until most of the liquid has evaporated, about 8 minutes, stirring occasionally. Distribute the meat mixture evenly in an oven pan and spread the pureed cauliflower/sweet potato on top. Use a fork to create texture in the cauliflower/sweet potato and drizzle with avocado oil. Place under the broiler for 5-7 minutes until the top turns golden. Sprinkle with fresh parsley and serve.